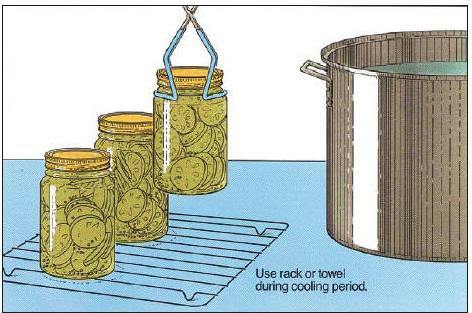 Water bath canning is the process most people use to can fruits, vegetables, jams, jellies, and pickles at home. Unfortunately, the canners rarely come with directions, and the instructions in many canning books can be complicated and hard to follow. 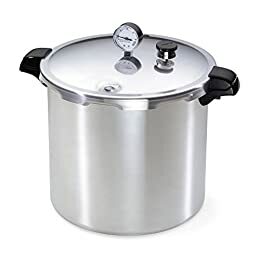 These boiling water bath canning directions below may serve as a guide and a reminder to the basic steps in home pressure canning food whether you have misplaced your canning books, are new to home canning or just need a refresher. Of course, you should refer to the more specific directions that came with your pressure canner. If you lost the manual, see this page for free replacement manuals which you can download and print. Also see this page for many specific recipes and directions to make many foods to can, from jams, jellies, pickles, applesauce and more! You may also find the glossary of home canning, freezing and preserving terms to be useful. Keep in mind that water bath canners are suitable only for acidic foods (see this Table of the pH and/or acidity of common fruits, vegetables, grains, breads and common food products). Low acid foods must be canned in a pressure canner. (See this page about how to choose a canner and this page about pressure canners). You must use the type of canner called for in the recipe. Keep in mind that you can always use a pressure canner as a water bath canner (just don't seal it up, so it doesn't pressurize!) 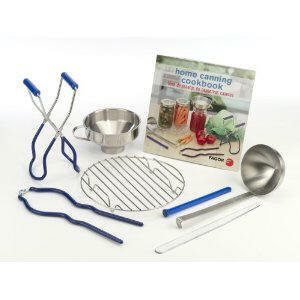 so if you can only afford one canner, get the pressure canner, and you can use it for all types of food. Pressure canners ARE much more expensive, though, so most people start with a water bath canner, even though it limits what they may can. The first step in pressure canning is to clean, inspect and assemble the pressure canner. Before each canning season, check the dial gauge for accuracy. The dial gauge is a delicate instrument which must be handled with care. Do not submerse cover or let gauge come in contact with any liquid. You should have the gauge inspected if the cover has been submerged in water or dropped, gauge glass is broken or has fallen out, parts are rusty, pointer is not in the "0" block, or if you believe the gauge may not be accurate. The gauge can usually be checked at your local county extension office. See this page: http://www.pickyourown.org/countyextensionagentoffices.htm to find your local county agent. If you are unable to have your dial gauge checked locally, carefully remove the gauge and call your canner's Consumer Service Department for directions. Also check the sealing ring, overpressure plug, and the rubber gasket of the air vent/cover lock. Replace these parts when they become hard, deformed, cracked, worn, pitted, or unusually soft. Check the jars for nicks, cracks, and sharp edges. Check the rings (screw bands) for dents or rust. Use only jars, lids, and bands in perfect condition so an airtight seal may be obtained. Wash and rinse jars, lids, and bands. Po ur hot water into jars and set aside until needed. A dishwasher is a great way to clean and preheat the jars. The jars and lids don't need to be sterile (unless the recipe calls for less than 10 minutes of "processing" in the canner; the canner sanitizes the jar as well as the contents), just clean and warm (to prevent breakage from thermal shock). Put the canner on your stove, centering on the burner and preheat the water to 140°F (just simmering) for raw-packed foods and to 180°F (barely boiling) for hot-packed foods. You can begin preparing food for your jars while this water is preheating. The recipe will tell you whether it is a raw-pack or ht pack. If you have a glass or ceramic stove, be sure that the canner does not overextend the burner by more than 1 inch, and check the stove's manual to be sure the use of a pressure canner is ok. See this page for more information about canning on glass and ceramic stoves. Select fresh firm food. Sort food according to size. Clean food thoroughly. Prepare according to recipe. (see this page for many specific recipes and directions to make many foods to can, from jams, jellies, pickles, applesauce and more!) Fill the hot canning jars promptly with food and liquid to recommended level (headspace) according to the recipe. Work out air bubbles with a clean nonmetallic spatula (see picture above). Wipe sealing edge clean with a damp cloth. Adjust bands snugly, so the jars don't leak, but not TOO tight! When moving jars with a jar lifter, make sure the jar lifter is securely positioned below the neck of the jar (below the screw band of the lid). Keep the jar upright at all times. 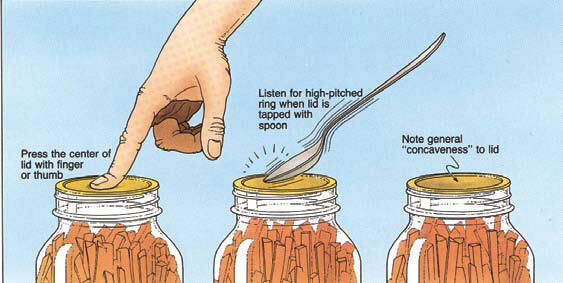 Tilting the jar could cause food to spill into the sealing area of the lid. Add more boiling water, if needed, so the water level is at least one to two inches above the jar tops. For process times over 30 minutes, the water level should be 2 to 3 inches above the jars. Put the cover on the canner. Add more boiling water during the process, if needed, to keep the water level 1 to 2 inches above the jar tops. Remove jars from canner with a jar lifter, trying to keep them upright without tilting. Set jars apart on board or cloth away from draft to cool. A towel or cake cooling rack makes a good surface. Leave at least one inch of space between the jars during cooling. Let the jars sit undisturbed while they cool, normally 8 to 12 hours. Do not tighten the ring bands on the lids or push down on the center of the flat metal lid while the jars are cooling. Once the jars are cooled, remove ring bands from sealed jars (otherwise the bands may rust in place and be hard to open). If necessary, wash jars and lids to remove all residues Put any unsealed jars in the refrigerator and use those first. When jars are cold, test seal, remove bands, wipe jars, label, date, and store in a cool, dry place. I use a permanent marker, like a Sharpie, to put the date and contents ("applesauce", strawberry jam", etc.) on the lid of each jar. I put the paper labels (see this page for free templates to make your own) on when I give the jars away, so the labels will look their best. Most canner foods will taste good for about a year. Technically, they are safe for years past this, as long as they remained sealed, stored properly and show no signs of spoilage. But after a year or two the quality and taste will appreciably decline. Option 3. Hold the jar at eye level and look across the lid. The lid should be concave (curved down slightly in the center). If center of the lid is either flat or bulging, it may not be sealed. If lids are tightly vacuum-sealed on cooled jars, remove screw bands, gently wash the lid and jar to remove food residue; then rinse and dry the jars. Label and date the jars and store them in a clean, cool, dark, dry place. A basement is usually an ideal location. The foods should remain tasty for up to a year. After that, it will remain safe to eat, as long as the seal is intact, but quality will slowly decline. Do not store jars above 95°F or near hot pipes, a range, a furnace, under a sink, in an uninsulated attic, or in direct sunlight. Under these adverse conditions, the food will lose quality in a few weeks or months and may spoil. Dampness may corrode metal lids, break seals, and allow recontamination and spoilage. Altitudes above sea level - Recipes normally include directions for the proper pressure and processing time if you are more than 1,000 ft above sea level. Canning jars, lids and rings - While there are many styles and shapes of glass jars on the market, only canning jars are recommended for home canning. canning jars are available in 1/2 pint, pint, and quart capacities with threads on which a cap may be screwed. See the chart below for the jar capacity of your canner. Additional information may be obtained from the manufacturers of canning jars. CLOSURES FOR canning jars: The two-piece vacuum cap consists of a flat metal lid held in place with a screw band. A rubber compound on the underside of the lid forms a seal during processing. Follow the closure manufacturer's directions for using the two-piece cap and for testing for a proper seal. If the closure has not sealed, completely reprocess or use the food immediately. Refer to the closure manufacturer's directions for additional information. 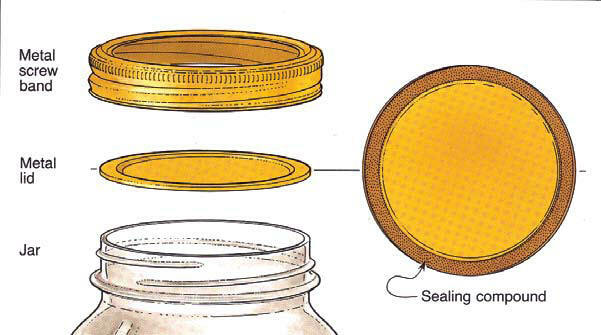 If a lid fails to seal on a jar, remove the lid and check the jar-sealing surface for tiny nicks. If necessary, change the jar, add a new, properly prepared lid, and reprocess within 24 hours using the same processing time. Headspace in unsealed jars may be adjusted to 1-1/2 inches and jars could be frozen instead of reprocessed. Foods in single unsealed jars could be stored in the refrigerator and consumed within several days. 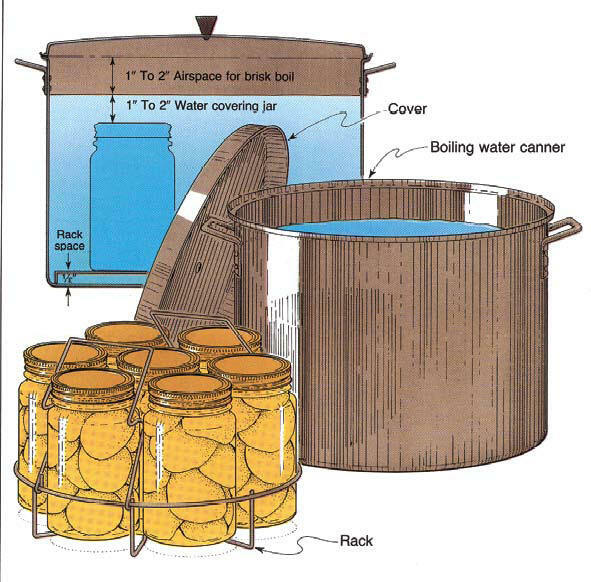 For water bath canners and other supplies, see this page! If you have a glass top radiant stove, see Canners for glass top stoves? See below for prices, descriptions and ordering options for pressure canners.